Quilted musings: February--Groundhog Day, Sally & Mary's birthday! February--Groundhog Day, Sally & Mary's birthday! I am happy to announce that Julie of http:www.jaybirdquilts.com has her first quilt published in Quiltmaker Magazine http://www.quiltmaker.com/patterns/index.html ! Congratulations Julie! Cornflower Fields is beautiful and I was fortunate to be able to quilt it for Julie last fall! 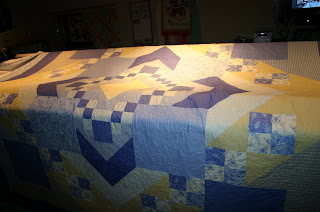 It was marathon quilting! I worked with Julie at Country Quiltworks in Montgomeryville, PA and she is so energetic and excited by all things quilty! Julie has several Moda Bakeshop projects on their website as well as quilts that were hung at Fall Quilt Market in Houston. Her Hunky Dory pattern is being kitted and sold by Fat Quarter Shop and Hancock's of Paducah! Way to go Julie! I am looking forward to see what else Julie has coming! I was pleasantly surprised to receive an advance copy of Quiltmaker in the mail, just because I was listed as the quilter! How nice is that???? 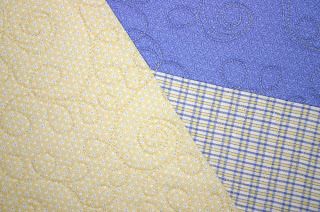 On my to do list are several baby quilts, I need to sew the last 2 rows of my Farm Fresh quilt that I am going to teach as a beginner class at Country Quiltworks www.countryquiltworks.net this spring. It's so bright and happy, all fruits and veggie farbics with had dyed solids, makes me yearn for my garden. kim it was great to work with you! !